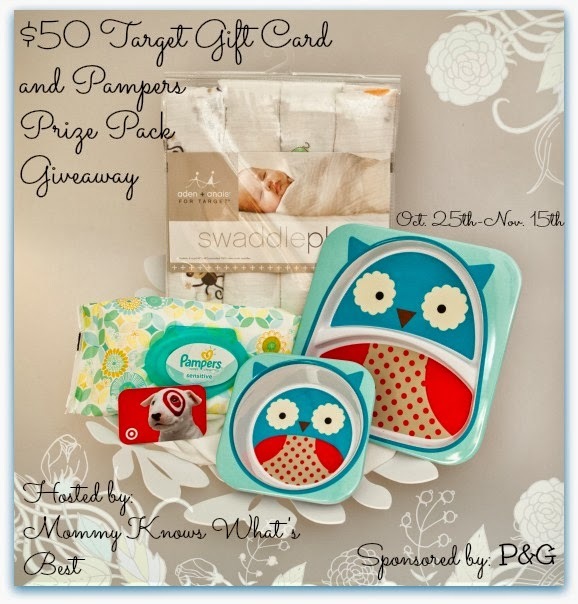 I couldn't think of a better giveaway that EVERYONE will love- Target, Aden & Anais, Pampers, and Skip Hop! Awesome! Did you know that Pampers diapers have undergone some major upgrades? Visit Mommy Knows What's Best HERE to learn about these new upgrades and find out about two awesome deals on Pampers diapers at Target! Disclaimer: Giveaway begins 10/25/13 at 1 am EST and ends 11/15/13 at 11:59 pm EST. Mommy Knows What's Best is responsible for prize delivery. One entrant/email per household. One winner will be chosen randomly from Giveaway Tools. Void where prohibited. The winner has 48 hours to respond to the congratulatory email. If the winner does not respond, a new winner will be randomly chosen by Giveaway Tools. Facebook, Twitter, Pinterest, and Instagram are in no way affiliated with this giveaway. If you have any questions, please email Marissa at MommyKnowsWhatsBest@gmail.com. Enter to win using the Giveaway Tools Widget below! Good Luck! My favorite upgrade is that Pampers Baby Dry are now up to 3x drier than regular diapers and can provide up to 12 hours of overnight protection! I love that they are making the baby dry and swaddlers in bigger sizes! I like that Pampers Cruisers are more absorbent and have Pampers' best fit so that active babies can play freely, cause my little guy never stops moving. I like that the swaddlers are more absorbent now! I like that they now offer the swaddlers in larger sizes. Babymoov Baby Food Processor Giveaway!